The eighth Russian-Indian naval exercise Indra Navy will take place in the Bay of Bengal, off the coast of India’s state of Andhra Pradesh on December 7-12. 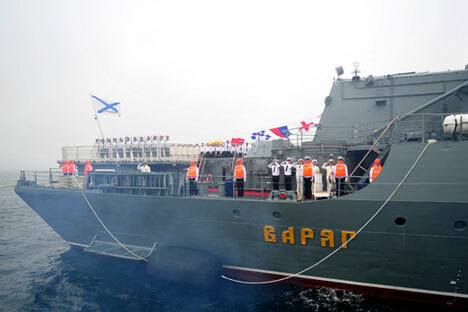 Four Russian vessels have come on Sunday to India to participate in the Indra naval drill, a source at the Indian Navy told TASS. Russia is represented by the Project 1164 (NATO reporting name: Slava-class) Varyag guided missile cruiser, Project 956 (Sovremenny-class) Bystry destroyer, Boris Butoma oceangoing tanker and Alatau rescue tug detached by the Russian Navy Pacific Fleet - they have come for the drills, the source said. India will be represented by the Project 17 Shivalik-class Sahyadri multirole frigate, Project 61-ME Nadyozhny-class Ranvir destroyer, Shakti tanker carrying the combined exercise-directing staff, Project 877EKM Sindhuvir diesel-electric submarine, a Boeing P-8 Poseidon maritime patrol plane, a Dornier Do-228 coast guard plane, two BAE Systems Hawk Mk132 trainers and several helicopters. The exercise will practice the protection of surface ships from submarines and fire against surface and air targets. A ship seized by a hypothetical terrorist group will be freed. Assault groups will land on board with helicopter support, the source added. In November, Russia and India held the Indra joint ground exercise with more than 500 men on both sides taking part. Operations against armed groups and mine clearing were practiced then. Indra is a joint, bi-annual military exercise organised by India and Russia since 2003. The word Indra is a portmanteau of the participants' respective countries. The exercise involves live firing drills, as well as air defence and anti-submarine operations. Additionally, counterpiracy operations and operations against terrorism and drug smuggling are parts of the drills.